"The development cycles in machine building cannot be measured in months. Therefore we are pleased that one of our latest developments in horizontal crosslappers, the “Hyperlayer” is now being installed in several spunlace production lines. 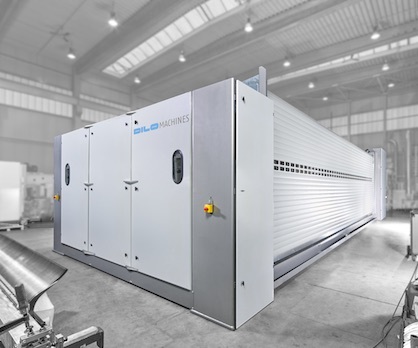 This crosslapper can realize infeed speeds up to 200 m/min due to its special design and is ideal for a low number of layers of lightweight webs", DILO announced in the run-up to the fair. The DILO-“Hypertex” installation, consisting of a yarn laydown unit from Ontec and subsequent needling, provides highly efficient inline production of reinforced needlefelts. With this system, scrim structures and preneedled weblayers can be needled together at speeds up to 20 m/min. The new needle arrangement “8000 X” ensures homogeneous distribution of needle penetrations in the felt over a wide range of advance/stroke. The results are considered a breakthrough for improved surface qualities, particularly for car interiors. The concepts above are only part of our continuous development and refinement work for needling and spunlacing lines. DILO would like to inform visitors about these topics at booth H3.0 H33 during Techtextil 2019 in Frankfurt and looks forward to meeting you.